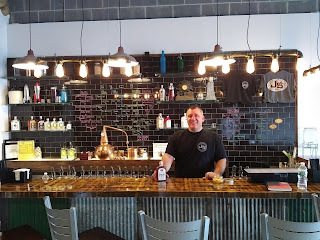 I show up at Philadelphia Distilling after a slog through most of the city's distilleries. Luckily, they are all within a couple miles of each other in an already-up-and-came area called Fishtown. It just goes to show how randomly the gentrification gods work. When I was growing up in New Jersey and would visit relatives in the suburbs of Philadelphia, the only cool area of the city I knew of was South Street. That consisted of a couple blocks of punk t-shirt shops and a tree completely covered in wads of gum. 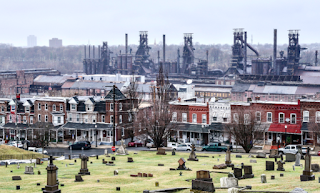 Fishtown is tucked away northeast of downtown, abutting the Delaware River. As you can imagine from its name and location, old factories and warehouses abound. Into one of these hulking brick buildings has moved Philadelphia Distilling. Its neighbors are a comedy club and a casino. 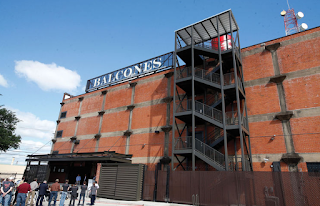 Walking into the distillery feels like entering the lobby of a luxury apartment building. It has an awning extending out to the street, which leads me to the glassed-in vestibule/gift shop. I'm warmly greeted by what I guess is a hostess, since the place doubles as a bar and restaurant (or maybe that's "triples"?) She regretfully informs me that the distillers have left for the day and the last tour just concluded. There's plenty of room at the bar, however, as folks are just beginning their weekend. I meet bartenders Jack and Canyon. 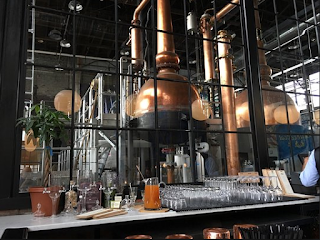 They hold court in front of a three-story glass wall, showing off two massive copper pot stills and all the rest of the distillery's piping and machinery. Who needs a tour when you can see it all from here? I get a little bit of background from Canyon. First, on himself. People normally start off commenting on his name. I am no different. He readily explains his parents were huge hippies. Assuming Canyon was named for where he was conceived, I tell him it could have been a lot worse. I'm not sure if he gets the joke. 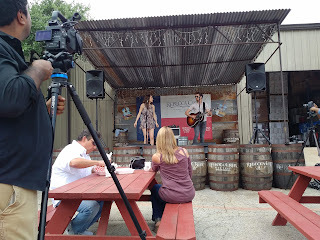 Canyon moves right along into the history of the distillery. 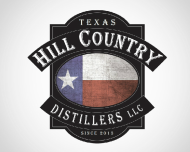 It started twelve years ago, making primarily gin, for which it's since won oodles of awards. Up until two months ago, the distillery was housed in a truly nondescript warehouse barely in Philadelphia, but a world away from trendy Fishtown. All those awards paid off, because they attracted a deep-pocketed investor. 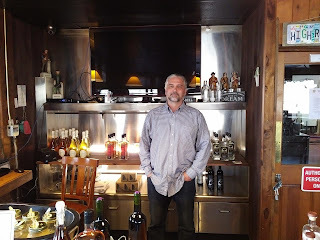 That allowed Philadelphia Distilling to buy, gut and remodel from scratch a smelting factory from the 1800s, transforming it into the beautiful showroom in which we now sit. Meanwhile, the distillery has been busy adding spirits to its roster, which now count five. I try their vodka, Old Bay-flavored vodka, gin, barrel-aged gin and absinthe. For all the equipment the distillery proudly displays, it seems that they don't distill their spirits from grain. 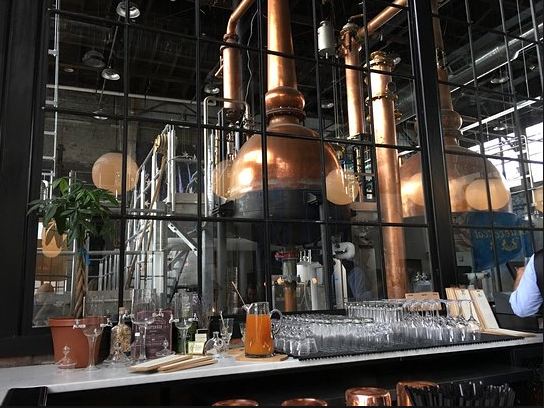 They start with neutral grain spirits and run them through a combination of two 660-gallon pot stills and a 22-plate column. The vodka gets a smooth finish from all those plates, and only the slightest hint of sweetness. The version in which they add Old Bay flavoring is a novel way to jazz up an otherwise clean and straightforward spirit. I'm not a fan of Old Bay to begin with. The flavored vodka is very aggressive up front, kicking me in the teeth with that sharp pepper and spice characteristic of the crab seasoning. I can see this playing nicely with seafood and/or livening up a bloody mary, if for some reason you ran out of your own Old Bay seasoning to add. I get to the gin Philadelphia distilling is so famous for. It is 94 proof and flavored with five botanicals steeping in distillate before a final run through the pot still. 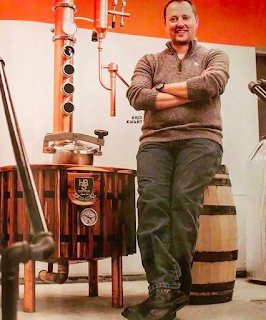 Philadelphia Distilling calls their Bluecoat Gin an "American Dry style." This may be confusing, because it seems to mash up two styles: London dry, which is very juniper forward, and American style, which highlights more citrus and coriander flavors. True to its descriptor, Bluecoat has both lots of juniper and citrus going for it. I don't get much of the coriander or angelica root, which are supposed to round out the mix. The barrel aged version of the Bluecoat is also 94 proof. It spends between two and four months in used oak barrels. The barrels themselves will be used to age gin twice before getting retired. The nose is a honey sweetness, with slight oak/wood notes. It's smooth on the palate, with the aging playing up the honey and vanilla notes and citrus finally creeping up on the backend. I have to finish with absinthe, because of the high proof (120) and strong flavors. 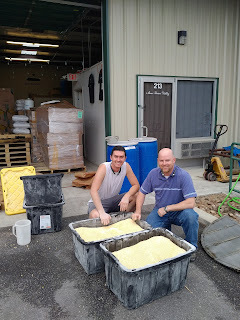 Philadelphia Distilling distinguishes their Vieux Carre absinthe as going through a "double maceration" process. 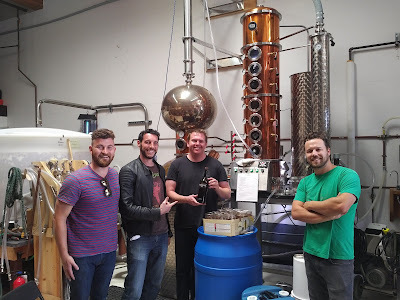 From what I can gather from Jack, who has taken over from Canyon in walking me through the tasting, the first maceration uses four botanicals. The distillate gets run through the copper still again, an additional six botanicals get macerated in the resulting distillate, before a final run through the still. The nose is predominantly of anise and vanilla. The palate starts off strong with skunky hops before mellowing out a bit to citrus and lemongrass. 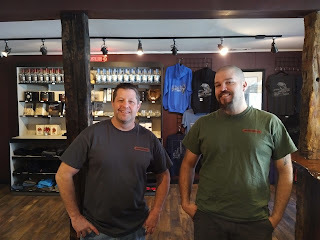 Without having taken a tour or speaking with a distiller, I'd say the most enjoyable part of my visit to Philadelphia Distilling is chatting with Canyon and Jack. These are two guys that clearly enjoy good drinks, whether it's making or consuming them. I leave as the place begins to fill up. The Edison bulbs on the chandeliers are just coming on. The din of the crowd rises a few levels. Framed by the towering windows, the early evening sky is hitting its first streaks of pink and bruise. And although it's still early, especially for a Friday, I am exhausted - and also elated. Philadelphia has come a long way since my teenage days of wandering around South Street, looking for the most offensive t-shirt - or maybe it's just me that's grown up.